Torrential rain on Saturday killed the planned practice day at Bicton Farm and nearly put paid to the second round of the Fast Eddy Winter on Sunday but the brave and the foolhardy turned out to battle the weather and each other for two races at this popular venue near Shrewsbury in Shropshire. Earlier in the week the course had been prepared to perfection with a new layout and new challenges. Unfortunately, all the hard work was undone by the unpredictable British weather. A very trimmed down course was used for the first race of the day that saw the youth riders in action but this was expanded to include the woodland section for the main adult’s race, even though it was still small compared to the usual layout. The rainfall had been epic overnight and continued early on until it cleared as the youth riders started their race at 9.15am. Course conditions were very slippery initially but improved slightly as the race progressed and lines started to form around the maze of sweeping bends on the stubble field. 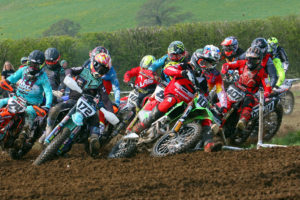 The 85-150 riders were first off the line but within a lap they had been passed by 65cc rider Jack Sandland, who was in his element. Spending most of the race on his pegs Sandland had lapped the field by the halfway point and managed to clock and extra two laps over Riegan Reece, also on a 65. Sandland took an impressive win with Reece second and fellow 65ccer William Barnett third. Top of the 85-150 class was Daniel Withington followed by Ben Houghton and Jake Willis. third in the YouthA class behind an in-form James Palmer and Charlie Chater in second spot on his new Yamaha 125 machine. Chris Wagstaff topped the vets A class ahead of Dave Cooper while Nick Barrow took the Vets B honours ahead of Andy Davies and Roger Withington. Jacob James had the Clubman class all to himself as condition took their toll and his competitors DNF’d. Carwyn Rosser headed up the Youth B’s some four laps ahead of Adam James in second spot while Ben Martindale took eighth overall and top Sportsman position for the umpteenth time this season. James Flannigan grabbed second place ahead of Chester Norton in third. It was a hard slog for all involved, especially with the hailstorm and heavy rain near the end of the race but it was billed as a Winter Enduro and it is November, the good weather wasn’t going to last forever.